I am in Hanoi, a guest of CARE, the international development agency, with a small group of staff from CARE and a local partner, walking through a small market. I see fresh vegetables and eggs, as well as meat of all varieties, from crabs (alive) to a dog (dead). We walk through the market to a stall selling plastic brooms of a variety of shapes. We walk through the stall, into a shed past a series of bikes with baskets, laden with brooms. We take off our shoes, and walk up a steep staircase onto a badly-lit platform, covered in bamboo mats. Six women welcome us, and offer us fruit. The room we’re in, if it can be called that, is about 15 square metres. It turns out to the bedroom of the women we’re talking to. In fact, eight women sleep in that room, and the bamboo mats are their beds. As my eyes get accustomed to the light, and I look around, I see their clothes on hangers covering the walls. They share one small bathroom and one kitchen, both downstairs just behind the bikes. ‘Is that six days a week?’ I ask, now trying to be realistic. ‘Seven,’ one of them replies. 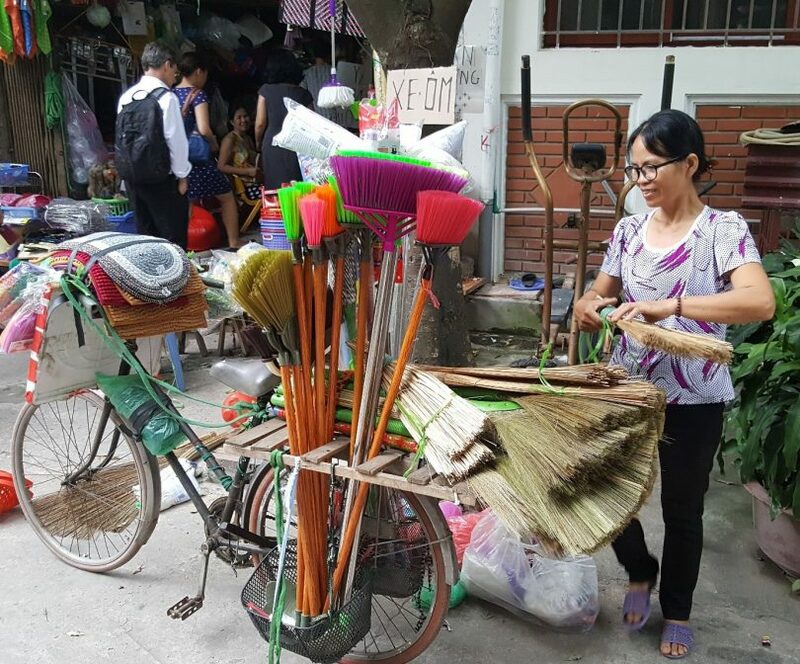 It’s an integrated operation: the woman in charge rents the property and buys the brooms wholesale. She’s from the same province as the migrant workers. The women are aged from 30 to 65, and all have children, some grandchildren. Yet they are all in Hanoi on their own. They have been there for years, some of them for decades. Are all here to send money back to their families, all with the same motive: to get their children a good education. They keep nothing for themselves, and are able to send about $230 a month back home — good money in Vietnam. Every few months they return home, primarily at peak farming times. The NGO that CARE supports runs workers’ clubs, of which these women are members. We ask them why they have joined. ‘The club gives us fun,’ is the first response. ‘It teaches us confidence,’ says another. ‘They help us handle the abuse we receive from other road users,’ another adds. The encounter lasted less than an hour. As I started climbing down the stairs, I tried to process my swirling thoughts. As desperate as their plight seems, these women must be, in some sense, better off for having come to Hanoi, despite living year after year in cramped conditions, without privacy, without their families. If they weren’t, they would return home. Yet the calculus they are applying clearly does not relate to their own welfare, but that of their family. These are brave women, sacrificing their own lives in the hopes that their children will have better opportunities. Poverty like this simply does not exist in Australia. Indeed, it is unimaginable to us. In Vietnam, for all its progress, such poverty is still widespread, in both urban and rural areas. It is shameful that Australia has just cut aid to Vietnam by 40 per cent, as part of broader aid cuts. Yes, Vietnam is a development success story, but it is still a country with millions of poor people. Average incomes in Australia are eight times those in Vietnam; average incomes in Vietnam are about a quarter of the Australian poverty line. We should be giving more aid, both from the government and through private donations. Migration, both international and domestic, presents wonderful opportunities for poor people. But the accompanying hardships would be reduced if better policies were in place. In this case, Vietnam’s registration rules discourage rural migrants from bringing their families to the city. For example, it would be difficult for these women to get their kids into an urban school. These workers need representation, dignity, and fun, to improve the quality of their lives and to magnify their voices. That’s where NGOs come in. I left privileged to have had a glimpse into the life of these brave women, proud to be part of an effort to support them, and reminded of the reality of absolute poverty, and the lottery of birth. Stephen Howes is the Director of the Development Policy Centre, and a member of the CARE Australia Board of Directors. He travelled to Vietnam in late June. Thanks Stephen – it sounds like this experience was a refreshing reality check. It was interesting (and wonderful) to hear their comment that the CARE-supported NGO club ‘gives them fun’. I often wonder about how happy people like these six Vietnamese women are. So, a bit like your comparative figures on incomes and poverty, I did a quick search of general national happiness indexes (… with all the qualifiers …) and I found that Vietnam ranked way above Australia in one report (UK think tank the New Economics Foundation) and far less happy in other reports (e.g. UN).